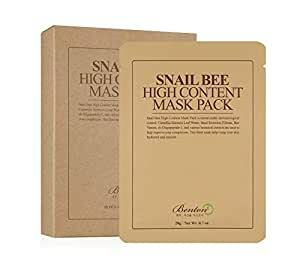 The Snail Bee High Content Mask Pack is for all skin types including sensitive and troubled types. In place of water, snail secretion filtrate and camellia sinsensis leaf water was used. It also incorporates ingredients such as bee venom, EGF and various botanical, natural componenets that work to improve rough skin damaged from environmental stress and pollution. The mask pack is an all-in-one functional, multi-care product that provides a cooling, soothing, moisturizing, brightening, anti-wrinkle and skin lifting effect.